It is an overused expression these days – “market niche”… but back in 1970, and through a desire to compete in the USA, the Rover Company came up with a car that truly did create a whole new market niche. In fact, this statement actually diminishes the Range Rover’s significance in the automotive history, because it was so much more than this… it truly was a completely new concept, one which thousands of people took to their hearts and adopted as their own favored mode of transport. In time, it also became an icon, a legend within its own lifetime – one which was recognized the world over. The story of the Range Rover really begins in 1948 with the successful introduction of the Land Rover. The Second World War had left the Rover Company with a hugely expanded factory (it was increased in size in order to meet the war time demand for armaments), but the company’s range of quality cars did not sell in large enough numbers to use the vast shop floor efficiently. Maurice and Spencer Wilks hit upon the idea of producing a four wheel drive utility vehicle, which was bound sell in large numbers, as it was a vehicle aimed at the agricultural and military market. The Land Rover, was inspired by the Willys “Jeep”, and immediately went on to become a huge international hit – its off-road ability was second to none, and the way it was designed (simple body panels bolted onto a separate chassis) allowed for easy repair by anyone with even the simplest tools. Everyone was happy – Rover’s management were, because they had significantly raised Solihull’s output – customers were because it was the car for all seasons that this sector of the market needed, and the government was, because in the years immediately following the war, it boosted the country’s exports significantly. The Wilks brothers did not give up on the concept and the idea of a more civilized off-roader was pursued further with the 1951 Road Rover. This car’s priorities were changed somewhat over the 80-inch Station Wagon, as sheer off-road ability was seen as a secondary consideration, compared with durability, practicality and on-road driveability. Gordon Bashford was the brains behind this car’s technical configuration, and it was he that decided against the use of the Land Rover’s chassis, instead choosing a shortened version of the Rover P4 platform – retaining its rear wheel drive transmission. Where the 80-inch Station Wagon, had a coach built body, the Road Rover, as it was called, used simple, flat body panels (as did the Land Rover) in order to keep down production costs. 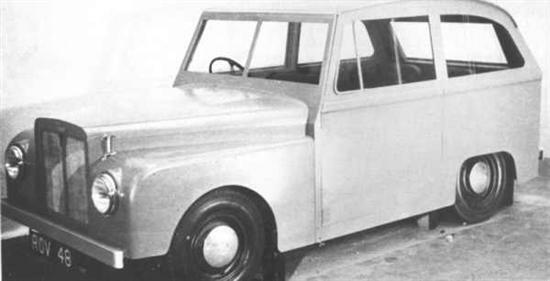 1951 Mock-up of the “Road Rover” had a touch of “Toytown” about it, but the 2WD rugged utility wagon, as devised by Gordon Bashford, seemed like a good idea to Rover’s management at the time. The continued success of the Land Rover lessened the need for a more civilized brother, so it’s development continued at a leisurely pace. The Road Rover idea might have been a good one, but the development program was conducted in a more controlled manner than its predecessor. The reason for this was quite simple: the Land Rover’s sales were proving to be a sustained success story, and the concerns raised by the Wilks brothers in the late 1940s was beginning to prove unfounded. Also, the development of the P4 saloons was taking most of the R&D department’s resources and so, the Road Rover tended to be overlooked. That is not to say it was ignored: Gordon Bashford continued with the project – and by 1955, it was being honed into a viable concept. It is said that Gordon Bashford even used one of the Road Rover prototypes as his own road car. In fact, in 1956, the Road Rover was developed into a Series II iteration, and because of Rover’s success with their new P4 model, it was decided to align it with the saloon models, as opposed to the Land Rover. The main difference between the new Road Rover and its older counterpart was the body style: out went the utilitarian look, and in came a smooth, sophisticated look that tied it in nicely with the upcoming P5 model. Technically, the Road Rover also changed: the wheelbase was increased to 98-inches, the front suspension was independent (like the P5) and the front brakes were now discs. Prototypes were built and the Road Rover got tantalizingly close to production – during 1958 production took place with a view to series production in 1960-61, but it never happened. Sales forecasts were not overly optimistic, although this is probably not the reason for the Road Rover’s demise: complexity, and a raft of new models, allied to the continued success of the Land Rover probably all played their part in the decision. Either way, the demise of Road Rover showed that Rover would not market a new utility-based model line unless the management were completely sure that it would not harm the company’s reputation. 1957 Road Rover Series II shows that the emphasis had shifted from being a sister product to the Land Rover, to one that was aligned with the saloon models. It could quite easily be mistaken for an estate version of the P5 – especially from this view. The idea never went away, and although Rover focused their efforts on getting the P6 into production, and continuing their research on the gas turbine cars, a more urbane utility vehicle was still on the cards. By 1964, and with forward development programs now in flux (thanks to the success of the P6), the company turned their attention to the American market, with the intention of developing a product that would significantly increase Rover’s penetration over there. The conclusion was that, thanks to the success of the newly-launched Ford Bronco and Jeep Wagoneer, the big growth area was in this market… in other words, the market that the Road Rover had been aimed at. By this time, Spen King had joined Gordon Bashford at the Rover Company, and it was both these men that put their minds to developing a car that would compete in this market. Technically, any such project would be an interesting one because it would involve a number of compromises. Unlike the Road Rover with its two-wheel-drive layout, management favored a full four-wheel-drive system in any new car aimed at this market – but it needed to offer a favorable on-road/off-road compromise… something that the original Land Rover did not need, as it was still viewed as an all-out utilitarian model. One thing that King felt in developing a suspension system for any car designed for this market, was the need for massive wheel travel and low-rate springs (which went against the thoughts that Brian Sylvester had in the direction of interconnection) because it would offer excellent bump-absorbency. More importantly, long suspension travel also ensured that the wheels would remain in contact with the ground more of the time, something essential for good off-road ability. Engine-wise, there was no contest: the V8 engine had been recently bought into the fold, thanks to William Martin-Hurst, and it would prove to be the ideal power unit for the new car. Torque characteristics favored the bottom end of the rev-range, and because of its aluminum construction, it weighed 200lbs less than the in-line 3-litre engine that would have been used had it not been for the introduction of the V8. This was early 1966, and the project was still very much in its infancy, and yet it looked so promising that Peter Wilks gave the project the go-ahead for further development. Gordon Bashford devised the finer points of the car in the following months: a box-section chassis, which had long-travel suspension, low rate springs and the V8 engine. Unlike the Land Rover, the new car would have its four-wheel-drive system, permanently engaged – primarily to ensure that the massive torque of the V8 was split evenly between two lightly loaded axles. The wheelbase of the new car was 99.9-inches, which was rounded up in the car’s name – in a nod to the earlier project, it became known as the 100-inch Station Wagon. The body was designed for simplicity of construction – being comprised of simple aluminum panels bolted to a steel skeleton. Throughout 1966, this concept was developed, and the first full-size mock-up was ready for January 1967. As can be seen in the accompanying photograph, it was this prototype formed the basis of the eventual design, and although it had been pretty much styled by Spen King and Gordon Bashford simply to clothe the mechanicals, they had received assistance from the styling department in order to give it acceptable proportions. 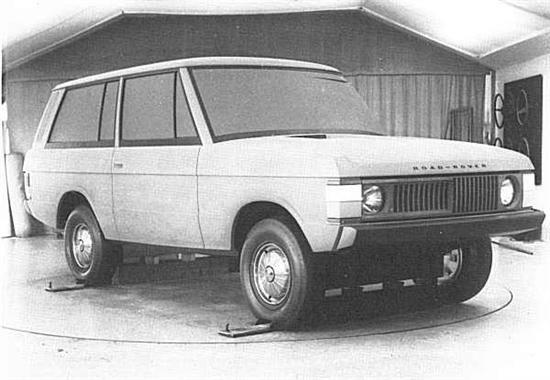 Accident in design: the 100-inch Station Wagon prototype was built up under the close scrutiny of Spen King and Gordon Bashford, and the body style in this photograph was intended only as a temporary measure in order to clothe the running gear, whilst David Bache devised the definitive design. However, the management of the company liked this proposal so much, they asked for it to remain, with only the lightest of changes. As recounted many times elsewhere, 1966 marked the time when the Rover Company was bought out by the Leyland Motor Corporation, but it was not until the early months of 1967 that Donald Stokes’ team actually scrutinized the new car. 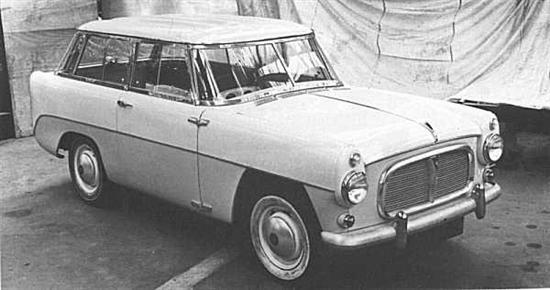 On the first viewing, Donald Stokes and John Barber were both tremendously excited by the 100-inch Station Wagon (as they were the Rover P8, that was also under development at the time) and gave it the green light for further development. From this point, the future of the car was sealed – and whilst Peter Wilks’ engineering department knuckled down to the task of finalizing the mechanical specification, David Bache’s studio was given the task of tidying the King/Bashford style into something more stylish. By September 1967, the first full-size running prototype was built, but because it was based entirely on Bashford and King’s original design, it looked spartan in the extreme – however it proved very capable in testing. The concept was good – and everyone within Rover knew that this time, they had got everything right. 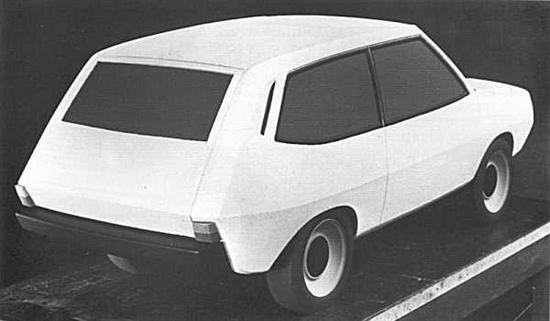 David Bache, meanwhile, worked on his task of cleaning up the design, but as can be seen in the styling photographs, very little was changed, and certainly nothing fundamental. As can be seen in this image, the David Bache studio worked on the original design, simply adding style in the more obvious areas. A more definite grille/headlamp arrangement was worked on, whilst some other detailing was tidied (look at the window surrounds, side swage lines and rear lamp clusters). This model was also badged a “Road-Rover” in deference to the older design study, but at the time (September 1967), it was still known simply as the 100-inch Station Wagon. By early 1968, the David Bache restyle on King/Bashford design was finalized, and signed off for production. Prototype testing was undertaken all over the world, and most of the time, the cars ran undisguised. The only acknowledgement to disguising its origins were the badges that it wore: VELAR (Which apparently stood for Vee-Eight LAnd Rover). Testing went well, and although it did not go quite well enough to meet the April 1970 deadline that British Leyland had wanted for its introduction, it still did extremely well – not only in off-road testing, but also in customer clinics. 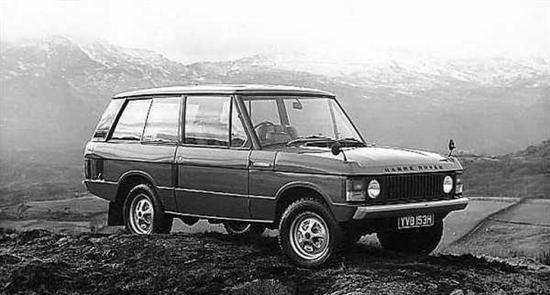 Finally on June 17th 1970, the Range Rover was launched to the press. It has passed into history that they loved the car one and all, but that was probably down to years of defining then refining the project, whilst sticking to the design they had arrived at, without undue modification. The result was that demand was immediate and sustained – customer waiting lists were drawn up as soon as the Range Rover appeared. The situation was simple: the Range Rover was launched at a price of £1998, and at the time, there was no opposition that could offer the breadth of ability that the it possessed. Not only was it a very accomplished off-roader, but it was also a commodious estate car and (as Rover would soon find out) something of a status symbol. 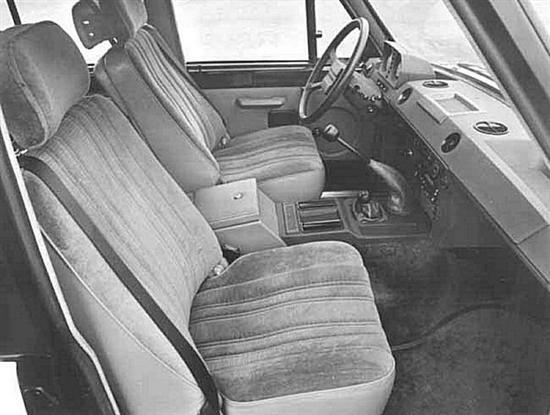 People liked the high driving position, and although farmers and commercial vehicle drivers might have been used to this, to the buyers of prestige cars such as the Volvo 145 or Triumph 2500, it was a completely new experience. 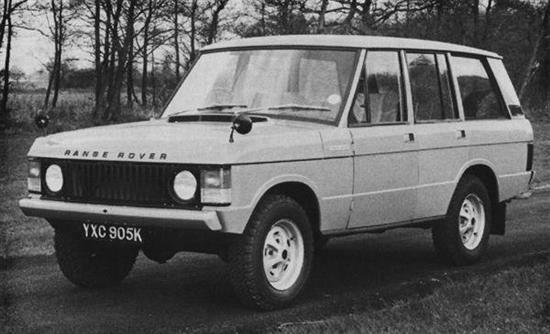 Very soon, Rover realized that people were buying their new baby for many other reasons than its off-road capability. There is not a lot to be said that hasn’t been already about the style of the Range Rover. Quite simply, this 1970 car was just about perfect in every detail (picture supplied by Graham Arnold). 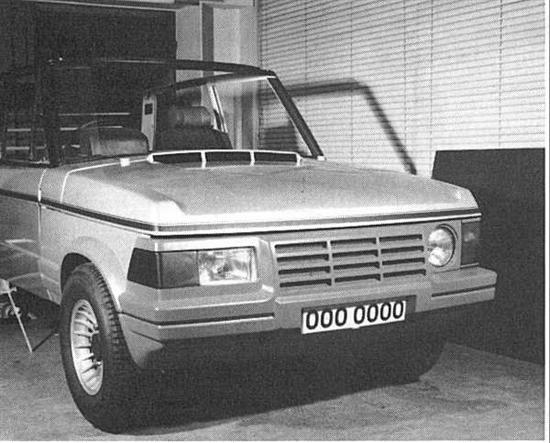 However, the Range Rover was a success in spite of British Leyland’s involvement. The company’s lack of development on the Range Rover was shocking – but in reality, and rather like the Mini at the other end of the model range, its underlying excellence would allow the company this neglect. It had to be this way, because British Leyland were fighting a huge battle in the middle of the market, where the majority of sales were – the Range Rover would have to fend for itself. Customers continued to buy it, however, and did so because it was such a unique car. In 1979, the tide began to turn, thanks to Michael Edwardes – and with it came some long awaited development. Following Edwardes’ reversal of the “Leyland Cars” one-badge-fits-all policy, it was only right that Land Rover should be separated from Austin-Morris and Jaguar-Rover-Triumph – so the formation of Land Rover Limited, as a separate and autonomous company in 1979 marked the beginning of some real investment in the company. Testing the water: Land Rover watched with interest the world’s reaction to the Monteverdi five-door conversion, which showed that the Range Rover’s style would not suffer unduly by the addition of two extra doors. Interior of a 1983 factory four-door version shows that the idea of a Range Rover with bare, utilitarian trim and hose-clean flooring has been consigned to history. This version was sumptuous and deeply carpeted – very similar, in fact, to its contemporary, the SD1 Vanden Plas. Outwardly, the first signs of change came in 1980, when the marketing effort behind the Range Rover was increased, and whereas before, it was sold alongside the Rover SD1 in the past, this was changed so that it became a bedfellow of the Land-Rover. Special Editions would also become increasingly important in the Range Rover strategy in the short term, but many engineering developments would finally filter through during the next few years. With the cash injection following the re-organization, much behind the scenes work was done on the engineering and marketing side of the Range Rover. Land Rover prepared three specials that would pave the way for full production versions if they proved successful enough. Rather cannily, Land Rover developed these models with the assistance of outside specialists, so as to minimize their own expenditure, and act as an insurance against failure. 1980 saw the introduction of the Monteverdi five-door conversion, and although Land Rover had approved the FLM Panelcraft version of the five-door Range Rover, it was the Monteverdi version that they liked the most. Despite the slightly truncated rear passenger doors compared with the final product, the overall view was that this Swiss theme was pretty slick and well executed. Land Rover Special Products approved the car for production, and offered it for sale through their own dealerships. Of course, Land Rover cannot have been encouraged by the Monteverdi’s pitiful sales (it was painfully expensive though), but the reaction to the five door concept added impetus to plans to introduce their own version. 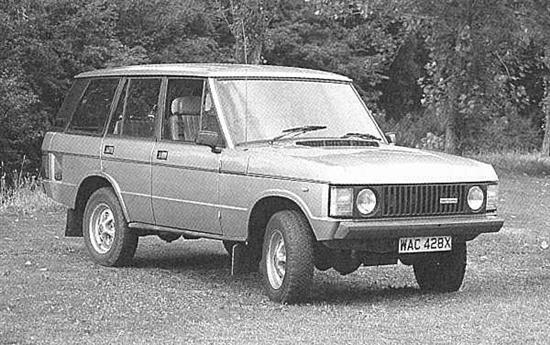 Rover had produced this four-door prototype Range Rover way back in 1972 – looking almost identical to the finished article. Sadly, the company did not have the resources with which to get it into production. The next special was produced with the help of Schuler – and appeared in late 1980. Ever since the development program of the 100-inch Station Wagon back in 1967-68, it was always envisaged that an automatic version would be launched. Because of lack of finances and other priorities within the company, the self-shifter never appeared. Thanks to the specialist market, however, Land Rover could test the market’s reaction to this (by approving it). 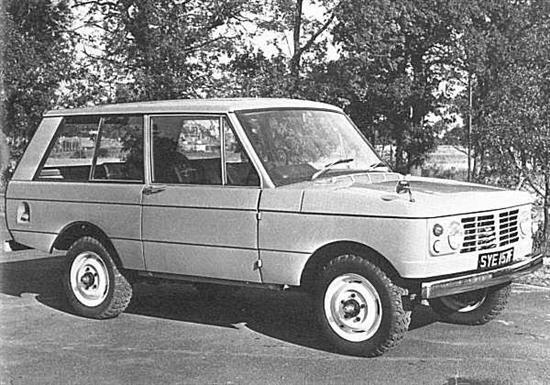 Schuler actually prepared their automatic Range Rovers to include a transfer box and anti-lock brakes… Once it became clear that the market would stand an automatic, Land Rover pressed forwards with their own development program based around the venerable Chrysler Torqueflite transmission. 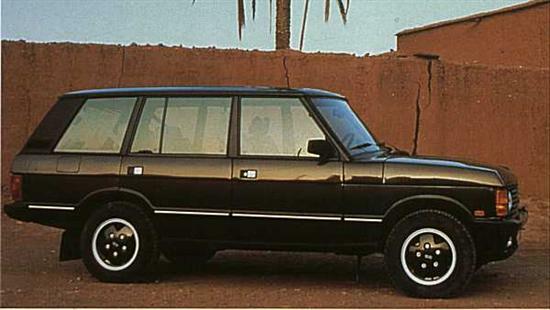 Finally, the third significant Range Rover special of the time was the “In Vogue” model, which was developed with the help of Wood and Pickett. The idea was a classical one: up-specify the interior and offer a range of special colors to make it stand out from the standard models. The choice of name followed the interesting marketing plan that involved lending a car to the glamour magazine Vogue and have them use the car as a backdrop for one of their high publicity photo shoots. 1980, and the scheme to improve the car’s frontal aspect bears fruit. Management decided not to pursue the project…thankfully. 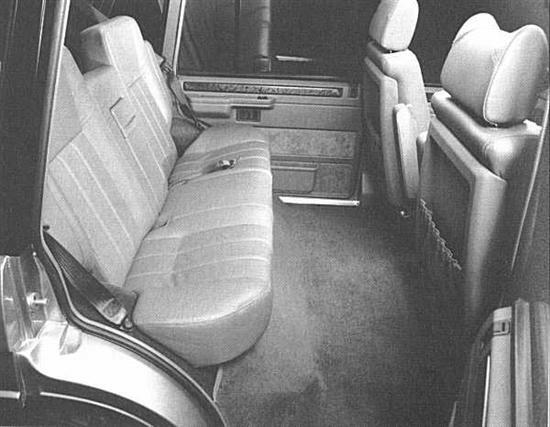 The rear room in the LWB Range Rover of 1992 was truly impressive. The car’s transformation from utility vehicle to luxury saloon, arguably, was complete. This longer model, denoted the LSE also benefited from the addition of an entirely new air suspension system known as ECAS (Electronically Controlled Air Suspension) sported some very sophisticated features. Apart from the added refinement afforded by the removal of steel springs, the system afforded the benefits of variable ride height, which could be used to great effect at high speed (when the ride height was dropped over 50mph). It also made loading and unloading a simple task because the vehicle dropped to its lowest setting when the car was at rest. The official long wheelbase conversion appears not to have harmed the Range Rover’s balanced looks one bit. The Range Rover continued in production for some time after its replacement, the P38A Pegasus model was launched, in September 1994, and one can only surmise that even after the introduction of the new car, the “Classic” Range Rover continued to sell well because it was a tried a tested model which still looked so very, very good. In its time, the Range Rover has been called many things, including the “Best 4x4xFar” and, “The Rolls-Royce of off-roaders” but one legacy it did leave was the trouble the company would have in replacing it. Certainly, the P38A was a better car, but somehow it never quite looked as good – a fact that can be seen in the two car’s production runs: over 25 years for the original, 7 years for its replacement. At the beginning of this story, the Range Rover was described as iconic… in many ways it was. Its contribution to automotive history can be seen in the multitude of posh off-roaders available today such as the BMW X5 and Mercedes-Benz M Class… before the Range Rover, the idea of a luxury off-roader would have been laughable; now it is accepted as much as front wheel drive is for small cars. Indeed, the Range Rover was an important car and it still is… another car, of which the British should be justifiably proud.